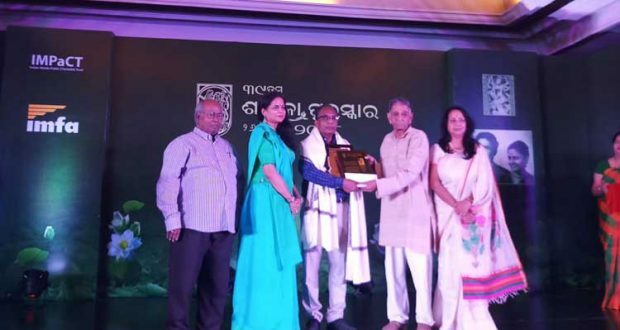 Bhubaneswar: 26/10/18: Poet Satrughna Pandav on Friday was bestowed with the prestigious Sarala Puraskar instituted by IMFA’s charitable wing IMPaCT. “It is a great feeling to be felicitated with the foremost literary award of Odisha as such recognition encourages and enhances creativity,” said Pandav. Two more personalities were also honoured for their contribution in the fields of music and art. While eminent tabla player Umesh Chandra Kar received Ila Panda Sangeet Samman, Binod Moharana was felicitated with Ila Panda Chitrakala Samman. “I am grateful to the institution for felicitating me. I had never worked for any awards. Still it is a nice feeling to be recognised,” said Moharana. Both received cash awards of Rs 1.5 lakh each along with citations. The Sarala Puraskar, instituted by eminent industrialist late Bansidhar Panda and late Ila Panda in 1979, is given by IMPaCT, the charitable wing of IMFA Group. The Sarala award is recognised as the foremost literary award of Odisha.